Employers set up payroll schedules in a variety of ways. One of the most common is the bi-weekly schedule. Each employee receives a paycheck for two weeks pay at a time on a 14-day cycle. When bi-weekly pay is calculated, it is done in two phases. First, each employee's gross wages (earnings) are totaled, and then payroll taxes are calculated and deducted to determine the actual pay. Under federal law, employees who work more than 40 hours in one week must be paid a higher overtime rate. Consequently, each week’s gross wages must be calculated separately and then added together. Taxes may be calculated on the total, so this part of the process is done only once. The first step is to multiply the employee’s hourly wage rate by the number of hours worked up to 40 hours. In some cases the employee’s actual wage rate is higher than the base rate. For example, a hospital must operate 24 hours a day and sometimes pays night shift workers a “shift differential” that is added to their base wage rate. Wages for any hours in excess of 40 are calculated using 1.5 times the wage rate, and this is added to the employee’s regular earnings. Part of an employee’s compensation may be derived from sources other than the hourly wage. This includes commissions and some types of performance bonuses. These amounts are added to the employee’s hourly earnings. Tips fall into a special category because employers can take a credit against tips received. The tip credit is a percentage of the minimum hourly wage multiplied by hours worked (including overtime). Subtract the tip credit from total hourly wages and then add in the total tips to find the gross wages for computing taxes. After taxes are figured tips are subtracted from net pay to find the amount the employer pays. 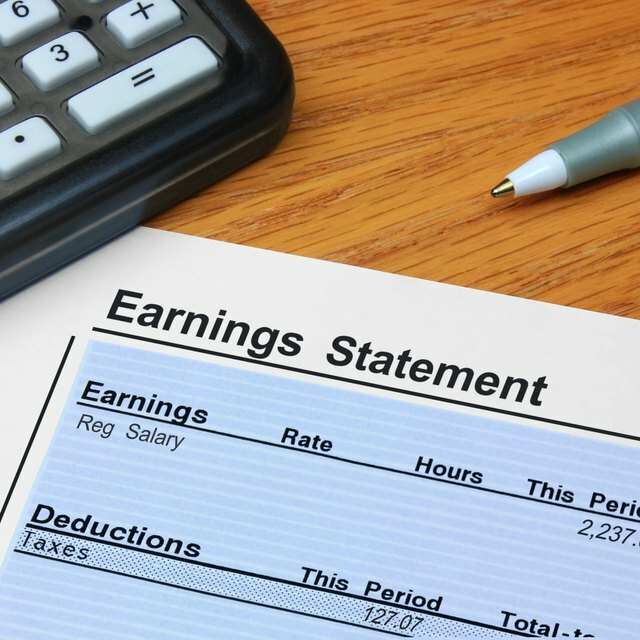 To find the employee’s net pay you must compute and deduct payroll taxes. For federal tax, first multiply the withholding allowances claimed by the employee on his/her W-4 form by the current value for one allowance. Subtract this amount from the gross wages to find the taxable income. Use the biweekly tax tables in IRS Publication 15, Circular E to figure the federal income tax to be withheld (see links below). For example, if a single employee with one withholding allowance has $500 in gross wages, subtract $140.38 (2009 biweekly withholding allowance) from $500 for taxable income of $359.62. In this example, the first $102 of taxable income is not taxed and the remainder ($257.62) is taxed at 10 percent (2009 rate) for a tax of $25.76. As of 2009 Social Security tax was 6.20 percent of gross wages up to an annual cap on income subject to this tax (for 2009 the limit was $106,800). Medicare tax is 1.45 percent of gross wages with no cap. Note that either tax rate can be changed by Congress, although this occurs infrequently. Most states and some municipalities also levy income taxes. Each has their own method of figuring the tax so you should consult your state/local Department of Revenue or Taxation. The final step in calculating biweekly pay is to subtract the taxes to be withheld from gross pay. This amount is the biweekly pay, but it will need to be adjusted for some employees for a variety of reasons before a paycheck is made out. If an employee is contributing to a retirement plan or to pay for health insurance these amounts must be deducted. Some employers also add reimbursement for business expenses in with the net pay. If this is the policy, it should be done at the very end of the payroll process after all wages and taxes have been calculated.